Advisories – Small groups of students will meet with an assigned faculty member each week for academic support and general counseling. Tutorials and Academic Support – Students will receive small group tutoring from Collegiate Teaching Fellows on a daily basis. The House System – The school community will be divided into four houses with students assigned at the beginning of the school year. The houses are organized to promote cooperation, responsibility, and peer accountability through student leadership and shared community values. 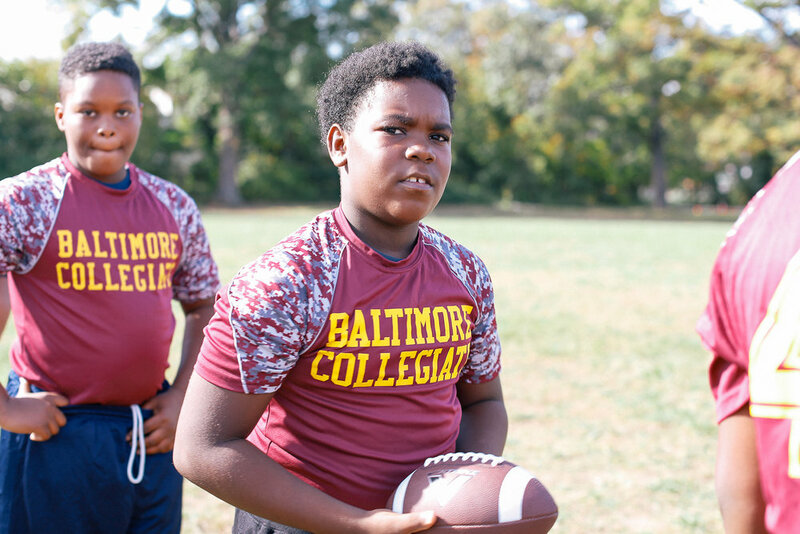 The Baltimore Collegiate curriculum is designed to prepare our students for success in school and in college, and to apply their knowledge to lead successful lives. The broad liberal arts curriculum promotes continuous learning for both scholars and teachers through critical thinking and problem solving. Our lessons come to life through inquiry-based teaching and learning, group activities and classic Socratic dialogue and discussion. Our academic and co-curricular program is designed to challenge our students to think critically, reason analytically, communicate clearly and solve problems. These four pillars of excellence and mastery will be accomplished through an integrated curriculum in which students investigate essential questions. The curriculum map for grades 4 – 8 can be found by clicking the button. Building excellence through sports development and competition in Football, Soccer, Wrestling, Chess, Swimming, Basketball, Track and Field, Baseball, Rowing, and Lacrosse. Collegiate Athletics are designed to promote the pursuit of excellence and to extend the core values and principles of the "Collegiate Experience" to sports training and competition. We hold a vision that every boy can be both a scholar and an athlete. In the best of educational institutions, we observe that the athletic field and the classroom are equally important in helping boys become engaged and passionate learners. We strive to ensure that our Collegiate athletes are academically accomplished, strong competitors on the playing field, well-coached, and proud to be part of an athletic tradition that will someday surpass all others. The importance of athletic competition cannot be understated. We envision that boys will become engaged in learning through non-traditional sports for male students in urban settings. We have developed a sports instructional model that connects values learned on the playing field with the habits of mind and character needed in the classroom: Preparation, Focus, Effort, Self-Reflection and Commitment. Along with any athletic skill we may teach, we will promote the pursuit of excellence, the development of loyalty and good sportsmanship, perseverance and resilience. We also hope that some young athletes will be destined for college athletics. Collegiate athletes will be expected to excel academically while competing, maintaining a strong GPA.